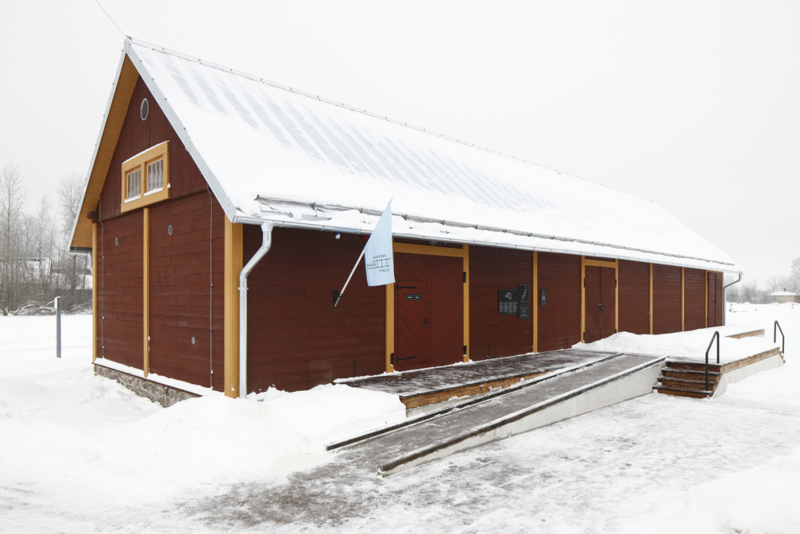 Last autumn, an exhibition about a unique narrow gauge railway line that is not only significant in the context of European railway history but is still operating today was opened at Aluksne Station baggage repository. 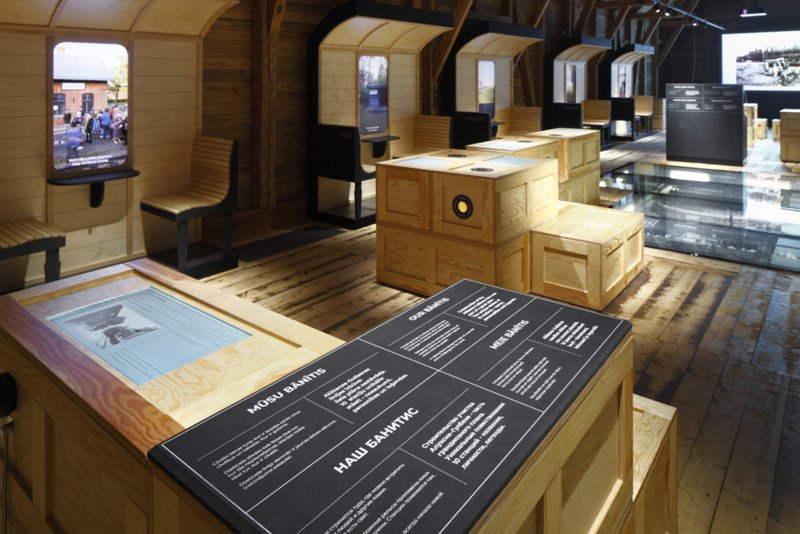 «H2E» has created it as a virtual journey in which visitors are offered the chance to sample an all–encompassing spatial, visual and sensory experience through sight, hearing and smell. 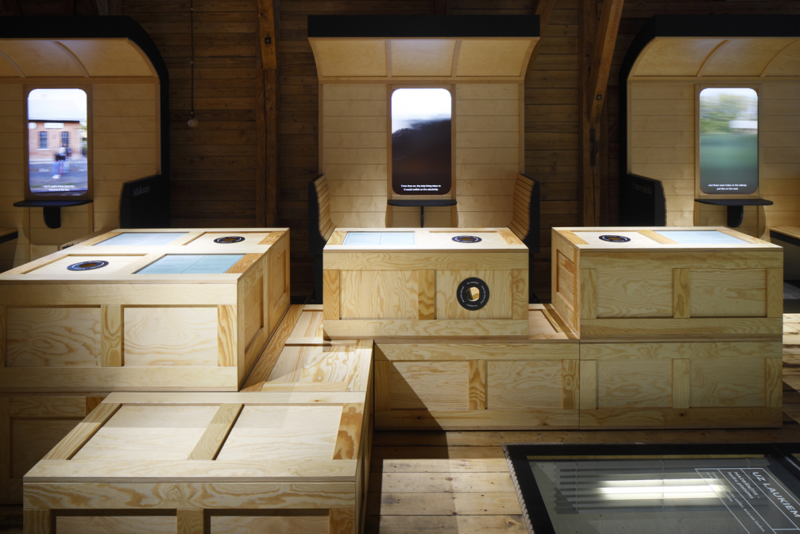 The exhibition’s design generates associations with travelling in a moving railcar. 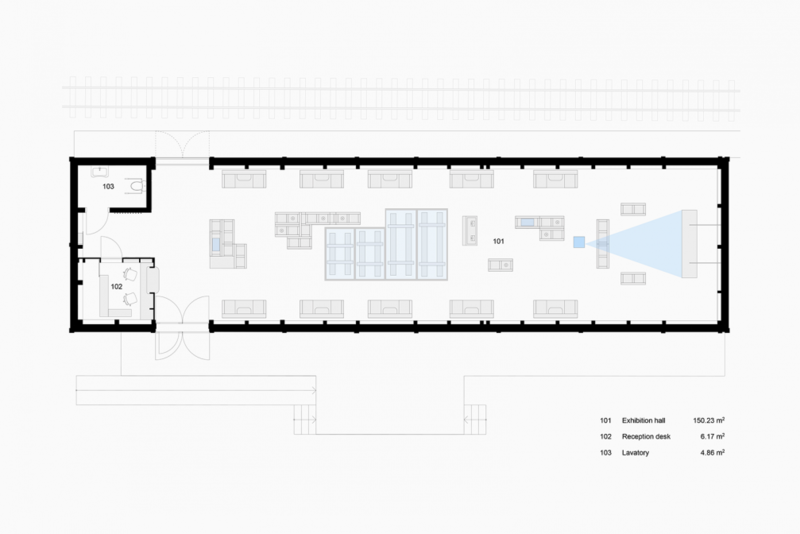 The impression of movement was achieved in practice through a combination of spatial layout, the use of multimedia and the dynamic composition of sound and lighting. 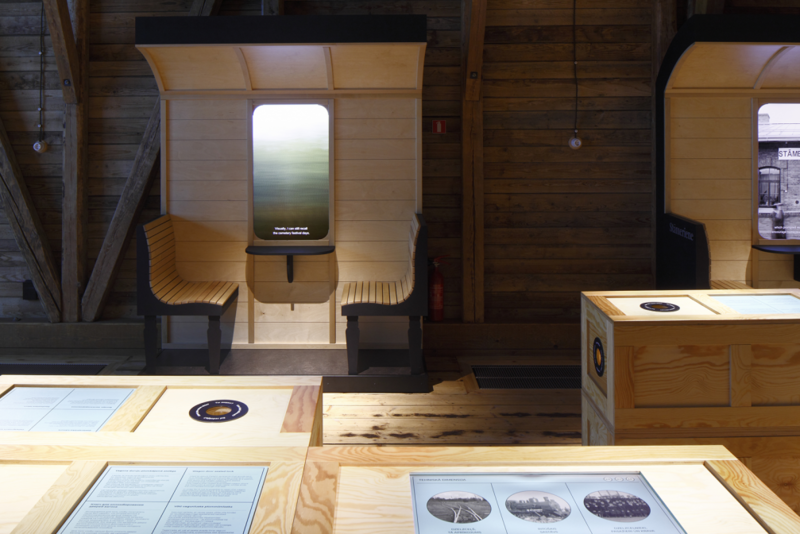 In the historical building around the perimeter along the wall, ten improvised passenger benches are located and on monitors that are integrated into the railcar windows, passengers can observe the slowly moving surrounding landscape. Video footage is augmented by local residents’ stories about the little train «Banitis» that rolls along the railway line. Referencing the building’s original function, wooden baggage boxes are used to position exhibits, which now store information instead of freight. 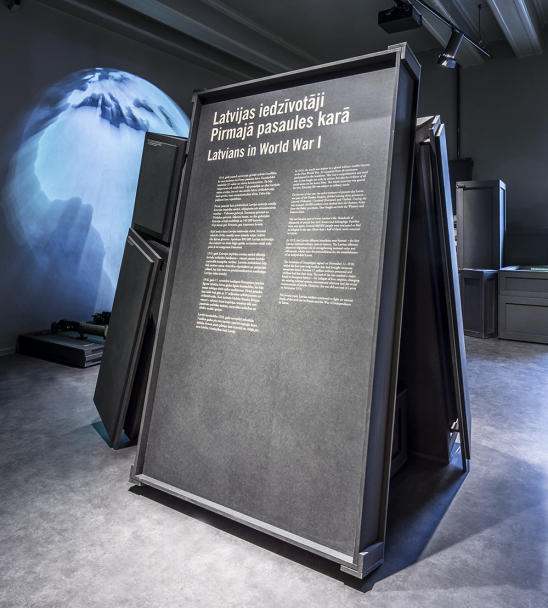 The contents of the baggage boxes vary — some have monitors or graphic boards integrated into them, whereas others contain authentic exhibits. 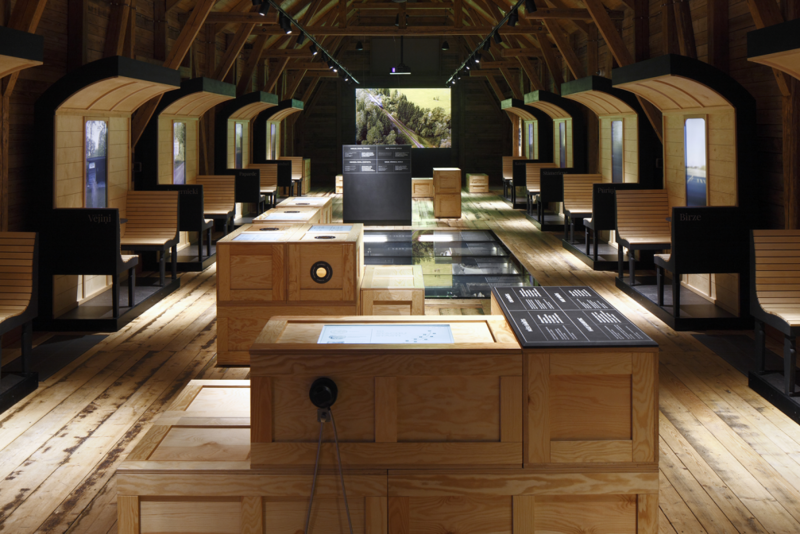 To make the acquisition of information interactive, exhibits can only be viewed by peering into a box through a round hole. 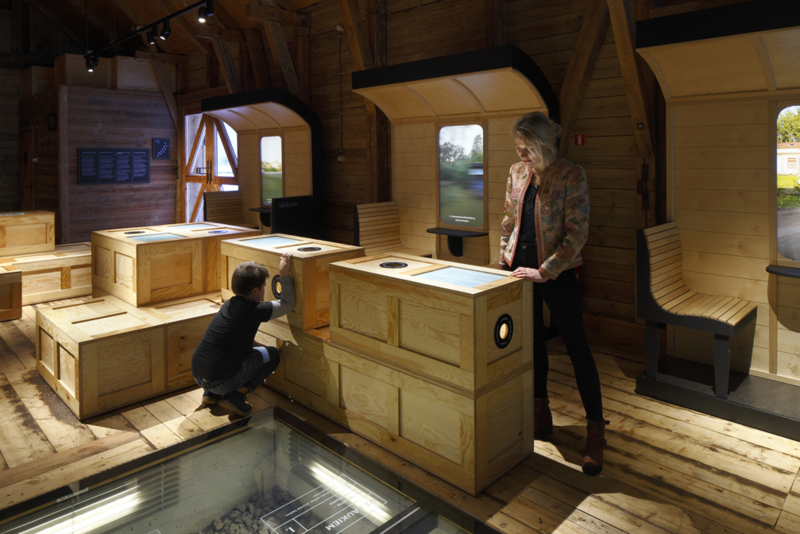 An inclusive engaging experience for visitors is provided by 3D virtual reality that allows them to see the world through the train driver’s eyes and to acquire knowledge about the most important technical features of the engine that propel the train into motion. 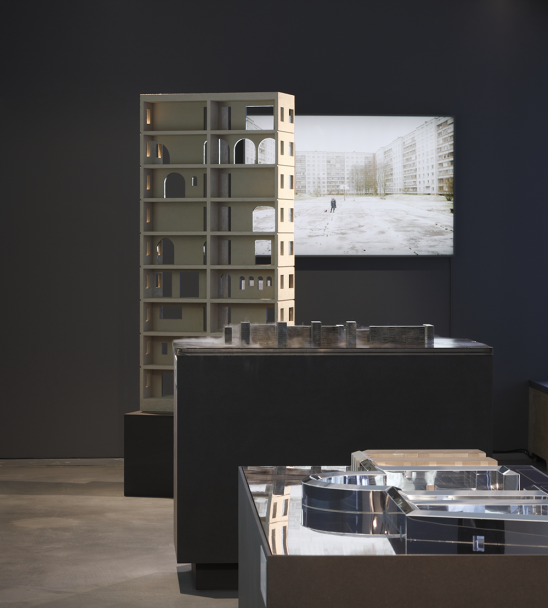 «The goal of the exhibition design was to create an illusion of movement in a stationary space. 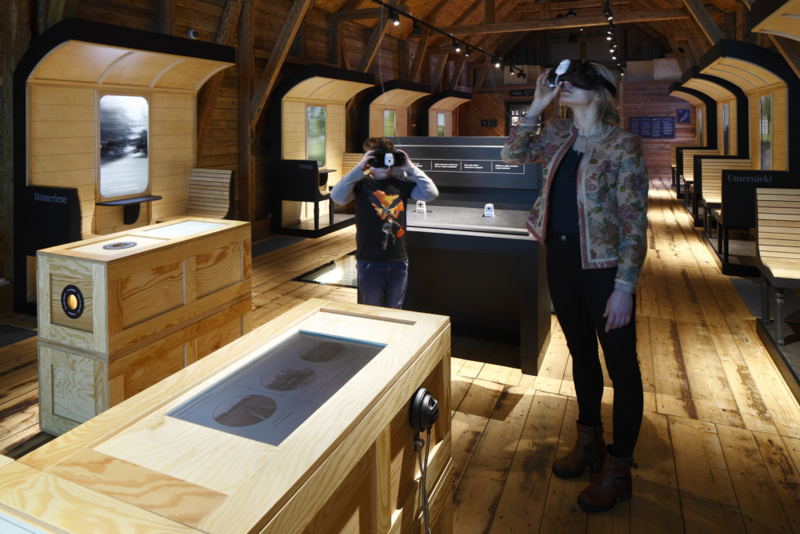 The virtual journey tells the story about the history of the railway and its technical aspects, which would highlight the importance of local industrial heritage in the context of broader transport history. 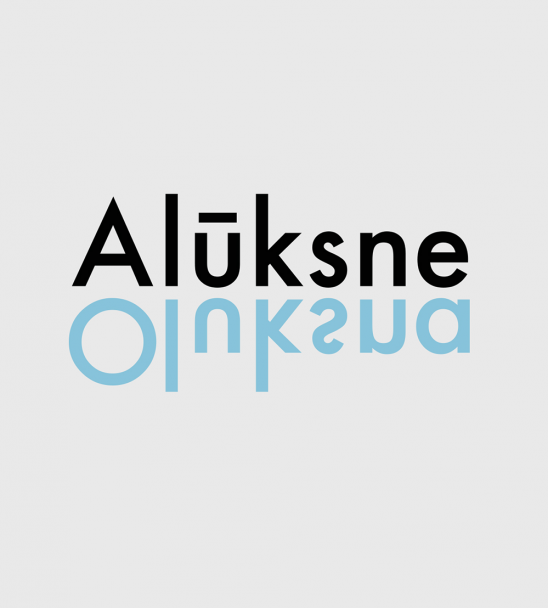 However, the most pressing concern was to achieve a balance between the use of digital and analogue communication media, in order to make it easier for visitors to perceive the overall message,» says Inguna Elere, Creative Lead of «H2E». 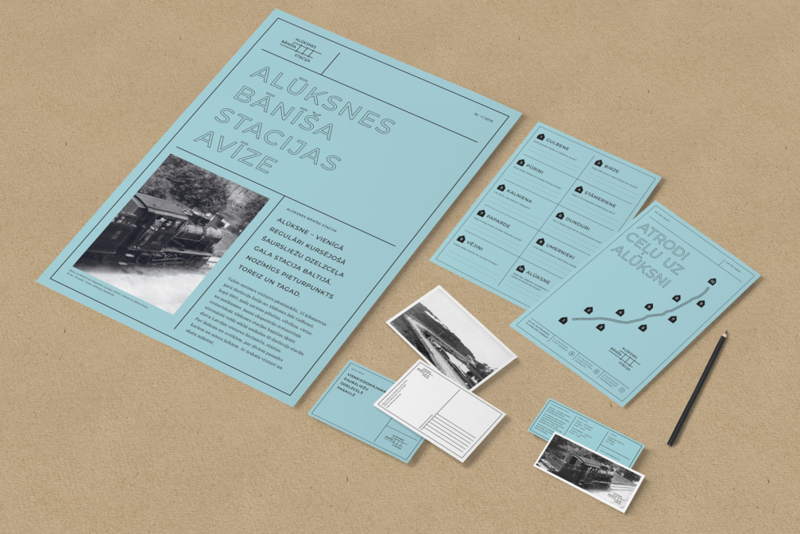 During the graphic identity development stage, historical materials such as typefaces, tickets, trademarks and other station documents were studied and reinterpreted in new graphic language. The graphic black and white lines are emphasised, while the light blue tone used in the graphic works was adapted from historical train timetables. The project was implemented in 2018. 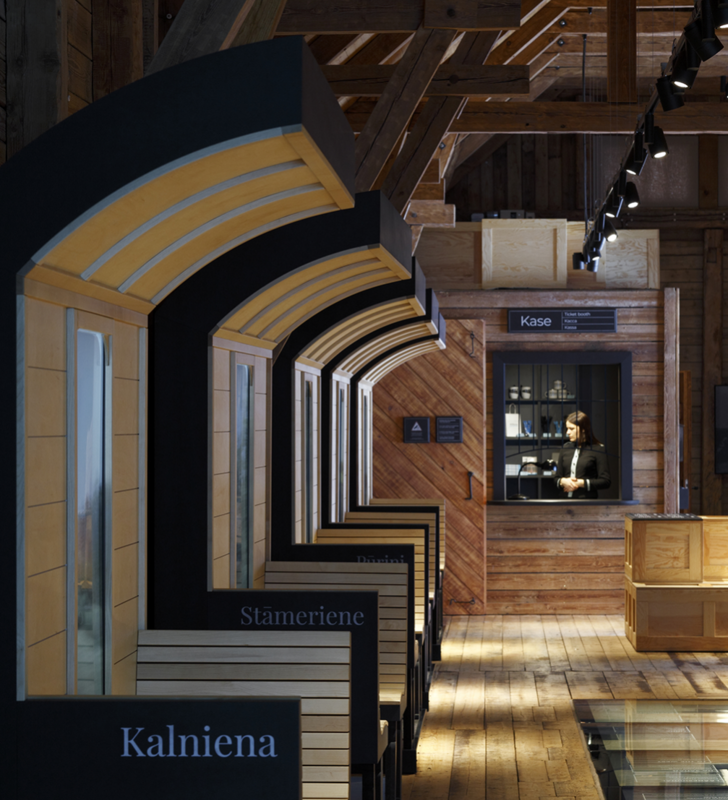 The historic baggage repository was renovated by architect bureau «Arhitektes Ināras Caunītes birojs». 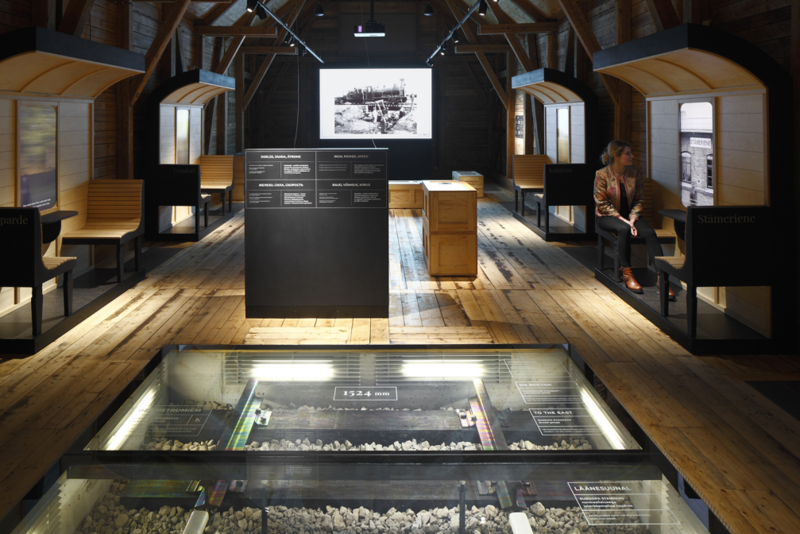 The content concept was initially made by the think–tank «Creative Museum» and later carried out by «H2E» in collaboration with industrial heritage expert Toms Altbergs.